Imagine a world without cactus. That's the world many people lived in until explorers to the New World began returning with unusual plant specimens unlike anything botanists of the time had seen. While cactus were a familiar sight to people of the Americas, the first cactus seen in Europe was said to be a prickly pear specimen presented to Queen Isabella of Spain by Christopher Columbus. You'll encounter various prickly pear cactuses in many areas of the Americas, including many Caribbean islands as well as the Galapagos Islands. Today, you may well run into these spiky treasures in Old World areas too, as some species have escaped cultivation and naturalized. Prickly pears are critical members of plant and animal communities. Various parts of a prickly pear provide food for tortoises, iguanas, rabbits, deer, peccaries, and many species of birds. They provide shelter for a variety of rodents; reptiles; and birds, including cactus wrens. Like other cactuses, prickly pears don't have leaves. Instead, spines grow from regularly spaced bumps on the stem. In prickly pears, as in many cactuses, minute, fuzzy-looking glochids grow from those bumps, too. Don't be fooled—glochids are barbed, sharp, irritating, and hard to remove! A prickly pear's trunk grows in thick, sturdy, jointed segments—called pads—that are usually elliptical and somewhat flattened. Smooth-skinned except for the spines and glochids, pads range in color from green to blue-gray. When the dry season comes, a pad stops growing. When rains start, new pads grow from older pads. You can't miss a prickly pear flower. Spring and early-summer blooms are large, and usually bright shades of yellow, orange, pink, red, or magenta. A flower gives rise to a large, fleshy, edible berry that may be green, yellow, red or purple, depending on the species. You might not think of cactus as a vegetable, but some species of prickly pear are cultivated for food in many countries. The tender young pads, known as nopales, are de-spined and used raw in in salads or cooked in soups, tacos, and other dishes. Called nopalitos when they're diced, they have a mucilaginous texture reminiscent of okra. People say they taste a bit like green beans. The large fruits—called tuna in Latin countries—are eaten raw or used to make syrup, jam, jellied candy, and wine. Large commercial prickly pear plantations produce these fruits and vegetables in their native Mexico and Colombia, but also in Israel, South Africa, Italy, and Spain. In Mexico alone, nearly 140,000 acres (56,000 hectares) is devoted to the cultivation of prickly pear. About 80 percent are grown for tuna, and 20 percent for nopales. Some prickly pears, notably O. ficus-indica and O. coccinellifera are the source of a natural red dye. But, it's not the cactuses that make the dye; rather, they are hosts to a parasitic insect—the cochineal bug Dactylopius coccus. Tiny, female bugs take up residence on a prickly pear pad, and they secrete a protective coating that looks a speck of white lint. An infested plant may have large swaths of this fluffy white covering. The bugs underneath are red. Dried and crushed, the insects are the source of cochineal dye, which is also called carmine red. The natural dye is used in textiles, cosmetics, pharmaceuticals, and foods, as well as in biological stains for microscopy. The valuable dye that comes from these tiny insects is one of the reasons prickly pears are found so far from home. Enterprising farmers brought the plants—and the bugs—to countries as far away as India and Australia, to produce the dye. In most of these places, the insects didn't survive, but the cactuses did! In spite of the availability of artificial red dyes, several countries, mostly in South America and Mexico, still produce the original carmine red that comes from cochineal bugs. The International Union for Conservation of Nature has included assessed 84 of the Opuntia species in its Red List of Threatened Species. Of those, one is Vulnerable, two are Endangered, and another two are Critically Endangered. For these species, the chief threats are loss of habitat due to commercial development, livestock ranching, and farming; plant collection; recreational activities; and climate change. One Critically Endangered species, O. abjecta, occurs only in Florida on Long Key, Crawl Key, and Big Pine Key. This native species has declined due to habitat destruction, the invasion of non-native kalanchoe plants, and deer—which eat the cactus and also damage the habitat. On these small islands, sea level changes related to climate change pose another threat. 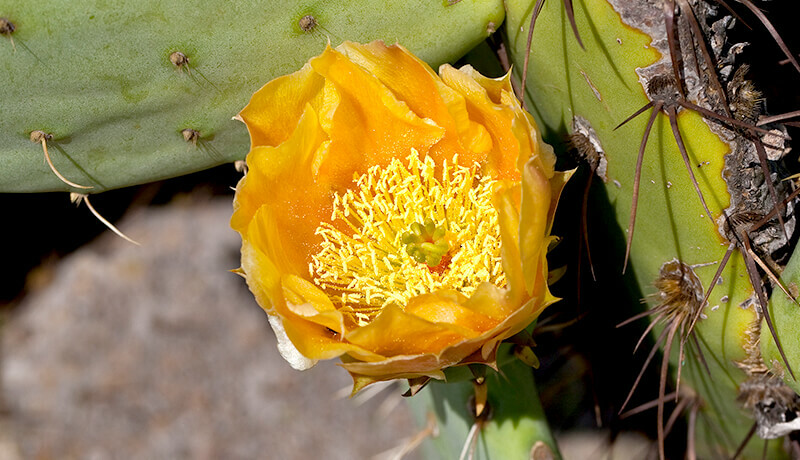 A California species, the Bakersfield prickly pear O. treleasei, is on the U.S. Fish and Wildlife Service endangered list as well the state list. In other places, these cactuses themselves pose a threat to native wildlife. In some places far from home, they have escaped cultivation and become problematic weeds that have proven difficult to eradicate. O. ficus-indica is included in the Global Invasive Species Database, a catalog of information about invasive alien species that threaten native biodiversity and natural areas. You can find this cactus in deserts of Arizona, Nevada, California, Colorado, and northwest Mexico, where it bears deep magenta flowers. It's a low-growing prickly pear, typically less than 1 foot (30 centimeters) high. Beware the clusters of one- to two-inch (three- to five-centimeter) spines on this tall prickly pear, which can reach eight feet (two meters) and bear hundreds of pads. 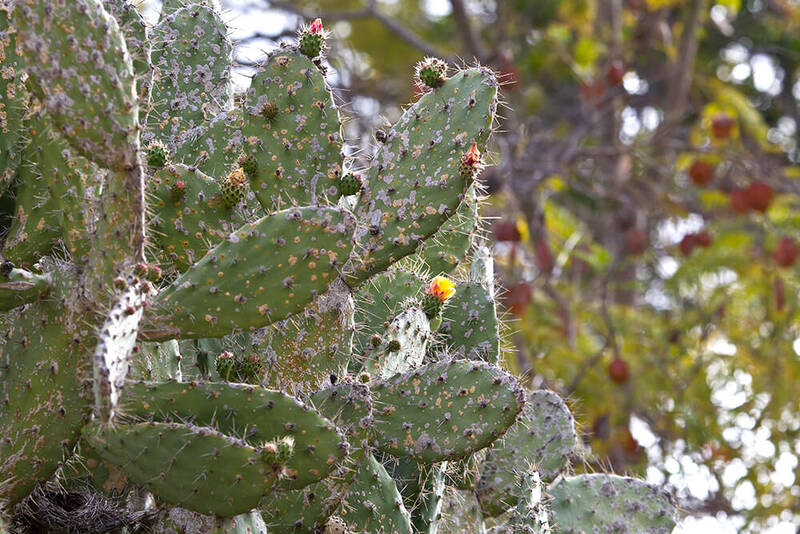 Find it in the southwestern US and northern Mexico, where it is also sometimes called the dollarjoint prickly pear. 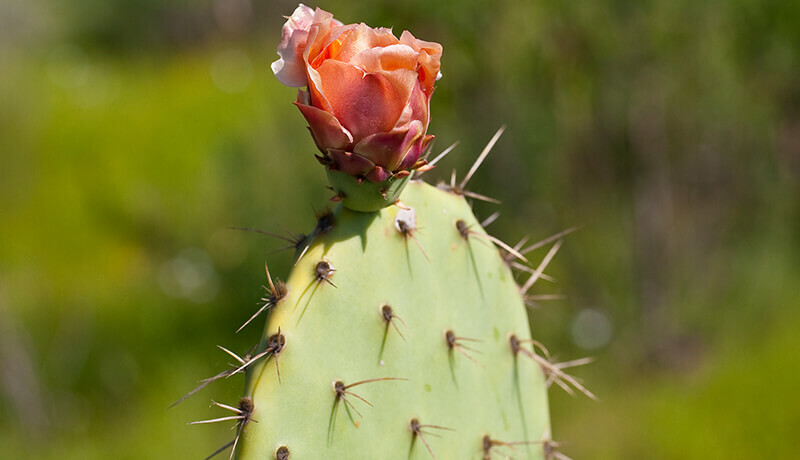 The pads of this huge—to 16 feet (5 meters) tall and wide—prickly pear can be 20 inches (50 centimeters) long. In spring and early summer, it bears large yellow-to-red flowers. You may find this cactus also called Indian fig or mission cactus. This Mexico native will stay rather small and do nicely in a large pot, growing to about two feet tall. In the ground, though, a plant can spread five feet. Flat, thin pads have regularly spaced tufts of golden glochids. When new pads grow, they sprout at the top of larger, old ones, and give the impression of a bunny's head. Flowers are yellow. The Barbary fig prickly pear O. ficus-indica has become established in several areas of the world where it's not native. In fact, it's so widespread that its original, natural habitat is uncertain, although it most likely originated in Mexico. Take California, for example: Spanish settlers planted it at all the California missions, giving rise to another of the plant's common names, mission cactus. It became a fixture on early California ranches, too, where it was sometimes used as effective fencing. Prickly pear makes good livestock food. The Safari Park's Nativescapes Garden showcases beavertail prickly pear O. basilaris as well as a specimen of pancake prickly pear O. chlorotica.